Yes, I know that was supposed to be last week. But I was confused, and shared photos instead. So here's a good flashback story. I wrote this about 3 years ago after a pack trip, and it's not really fiction. We had some good t-storms again this time, so I thought I'd pull it out. It's super short. And yet. My gut is haunted by the memory of a friend who died under a fallen tree, asleep—we can only hope—in his hammock. This isn’t at all the same thing; the wind is oddly light, though the same can’t be said of the rain. Some of it might be hail, but I’m not looking out to see. And if a tree has my name on it… there is nothing to be done now. This year's t-storms weren't quite so much on top of us, and were in the afternoons rather than at night. 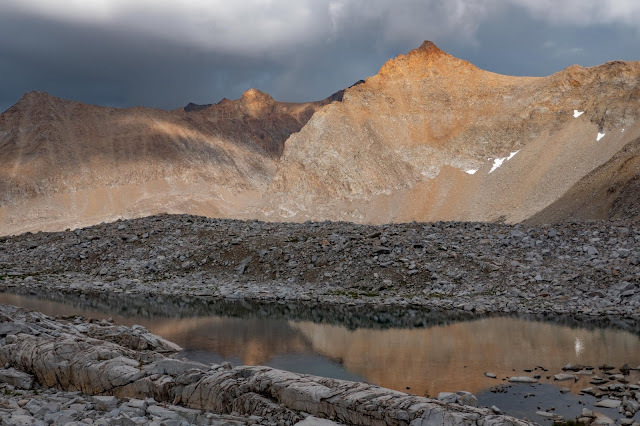 But we got one good storm while camped in a high basin, surrounded by high peaks that made a great curving wall for the thunder to echo off of, so that every crack seem to roll on forever. And we had hail. Plenty of hail, which is amazingly loud on the top of a tent! Storm clouds moving away after dumping rain and hail on us.